Elgato's Game Capture HD is one of the most widely-used game video capture devices on the market — it's what many of us here at Kotaku used to grab gameplay footage. Today Elgato introduces it's next-generation capture device — the Game Capture HD60, capable of recording 1080p at 60 frames per second. Launching August 15 exclusively at Best Buy, the $179.99 Game Capture HD60 arrives just in time for YouTube's push towards 60 FPS video. This model is much sleeker than its predecessor, with lovely rounded edges and a silky rubberized finish. 1080p60 support. Elgato Game Capture HD60 uses superior H.264 hardware encoding to create incredibly smooth footage in easily manageable files that you can access directly on your PC or Mac. Flashback Recording. With Elgato Game Capture HD60 you don't have to worry about pressing the record button - simply slide back in time on your PC or Mac and hit the record button retroactively. Built-in Live Streaming with Stream Command. 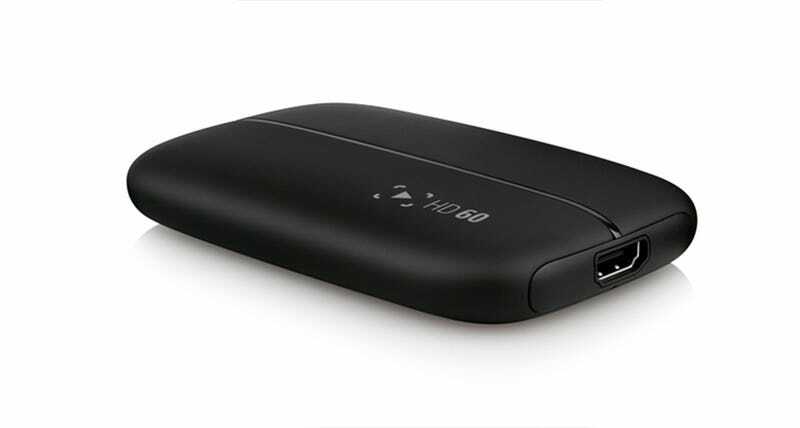 Elgato Game Capture HD60 gets you up and running on Twitch, YouTube, Ustream or Dailymotion in a snap. The brand-new Stream Command makes it easy to add your webcam and overlays. Add your voice with the built-in Live Commentary feature. Simultaneous live streaming and high quality capture. With Elgato Game Capture HD60 you don't have to choose between streaming and recording. No matter what resolution you broadcast, you can simultaneously capture full resolution 1080p. We'll have a chance to test out the HD60 soon, so stay tuned for a full reckoning of its prowess.